As a last minute Christmas card, this object from the Museum’s small objects collection is pretty useful. 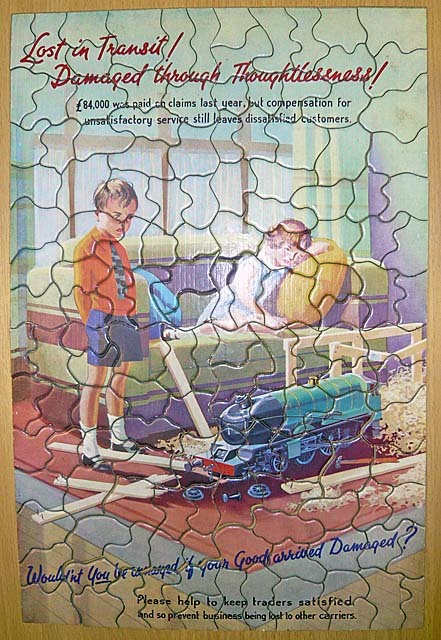 The jigsaw was given by the Great Western Railway around 1935 as a Christmas present to employees, as a way of reminding them to handle parcels carefully. The childrens’ upset at seeing the dented locomotive smokebox door and detached wheels is plain. ‘Lost in Transit’ was cheaply made with a card backing and was difficult to put together (as the Museum staff who were around when we reassembled it for photographing will attest). Because of this, the jigsaw was only issued for one Christmas, and is now the rarest of all the Great Western Railway promotional jigsaws. Ours did arrive in once piece and is in perfect condition! This entry was posted in Small object collections and tagged christmas, jigsaw, parcels, post. Bookmark the permalink. It would be a great shame if after all the trouble that the NRM have gone to in getting all the 6 A4s together that one of them will not be painted in the original Silver livery, so come on NRM its not to late to do it. Bittern was painted in silver once. A great oppertunity not to be missed, it will never happen again having all 6 together, lets have one in Silver, please.